oftwominds-Charles Hugh Smith: Could China's Housing Bubble Bring Down the Global Economy? Could China's Housing Bubble Bring Down the Global Economy? Who's going to buy the tens of millions of empty flats held as investments? I've been writing a lot about China recently because it's becoming increasingly clear that China's economy is slowing and the authority's "fixes" are not turning it around. That means the engine that pulled the global economy out of the 2009 recession has stalled. Many people see China's slowdown as the source of the next global recession, but few seem to realize the extreme vulnerability of China's vast housing market and the many knock-on consequences of that market grinding to a halt. I've just completed a comprehensive review of China's housing market, and now realize it's much worse than the consensus understands. The consensus view is: Sure, China's housing prices are falling modestly outside of Beijing and Shanghai, but since Chinese households buy homes with cash or large down payments, this decline won't trigger a banking crisis like America's housing bubble did in 2008. There is no substitute source of revenue waiting in the wings should land sales and housing development grind to a halt. Local governments will lose 2/3 of their operating revenues, and there is no other source they can tap to replace this lost revenue. Since China authorized private ownership of housing in the late 1990s, homeowners in China have only experienced rising prices and thus rising household wealth--at least until very recently, when prices dipped as the government tightened lending standards and imposed some restrictions on the purchase of flats as investments. Though it's difficult to quantify the "wealth effect" the rapid rise in housing valuations supported, it's widely acknowledged that upper-middle class household spending has increased as a direct result of housing's wealth effect. Though few dare acknowledge it, prices in desirable first-tier cities urban cores are completely unaffordable to average households. Average flats in Beijing now cost 22X annual household income -- roughly six times the income-price ratio that is sustainable (3 or 4 X income = affordable cost of a house). Far too many observers use housing prices and sales in Beijing and Shanghai--a mere 3.5% of China's population and housing stock--as the basis of entire nation's housing market. This is akin to judging America's housing market on prices and sales in Manhattan. So while sales are soaring in Beijing, they're falling 26% in the 2nd, 3rd and 4th tier cities. Though it is widely known that China's household wealth is concentrated in housing, the extent and consequences of this concentration are rarely discussed. Much has been made of the $3+ trillion losses households have suffered as China's stock market bubble collapsed. 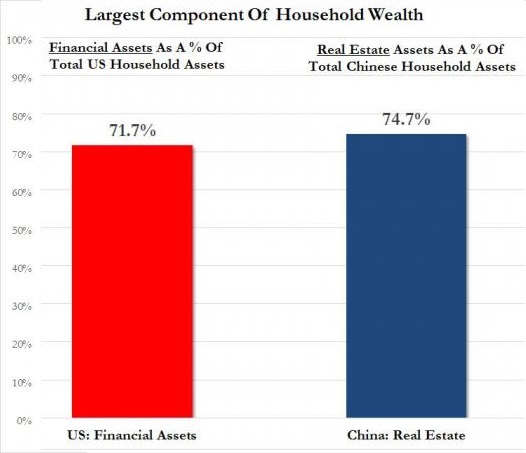 But given the relatively insignificant role financial assets play in household wealth, these losses are modest compared to the far larger loss of household wealth that will occur as housing deflates from bubble heights. They also overlook the extreme concentration of wealth that goes into every purchase of a small flat by households that really can't afford the cost: the entire extended family's wealth is often poured into the flat, and money borrowed from friends and relatives or even loan sharks. The other problem few Western analysts consider is the impaired nature of much of China's housing stock. Millions of units constructed in the early 2000s were hastily built and are now degraded. Newer buildings are not maintained, either, and there is a strong cultural preference for new homes, not existing units. (The government doesn't even keep track of resales/sales of existing homes; whatever minimal data is available comes from private brokerages). In other words--who's going to buy the tens of millions of empty flats held as investments? What is the market value of flats nobody wants to buy or cannot afford to buy? China has a demographic problem as well. The generation now entering the work force is much smaller than the generation that bought two or three flats for investment. There simply aren't enough wage earners entering the home-buying years to soak up this vast and growing inventory of empty homes. China's stated intent is to move from a fixed-investment/export dependent economy to a consumer economy. But if we consider what happens when housing slows or even grinds to a halt, we realize the impact on incomes, wealth and consumption will be extraordinarily negative, not just for China but for every nation that sells China vehicles and other consumer goods. My new book is in the top 20 of Amazon's Kindle ebooks > Business & Money > International Economics: A Radically Beneficial World: Automation, Technology and Creating Jobs for All. The Kindle edition is $9.95 and the print edition is currently discounted to $20.82. Thank you, Marvin M. ($50), for yet another wondrously generous contribution to this site -- I am greatly honored by your steadfast support and readership. Thank you, Ben G. ($75), for yet another superbly generous contribution to this site -- I am greatly honored by your support and readership.